Sign up at the market Info Booth! Love to shop at the farmers market? 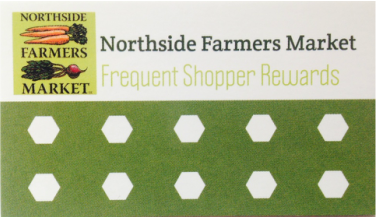 We want to give back and inspire you to visit Northside favorites, and so we've partnered with Northside shops to give three lucky winners each month gift certificates to a hot spot. Get a card and sign up at the Info Booth. We keep the card at the booth so you never forget it! Visit the market Info Booth each week to check a visit off on your card. 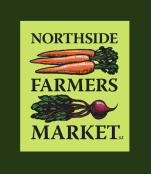 After 3 market visits, you get entered into that month's raffle to win a gift certificate to a Northside restaurant! PLUS-You'll get special emails with market recipes, updates, and info about each month's featured shop!